It was outside an abortion business on Ethan Way by the California State Exposition, in the City of the Most Blessed Sacrament, on Thursday, October 30, 2014. The abortion business later closed. The hymn in the podcast, below the photos, was played during the Exposition. In the matter of the insoluble problem of Boko Haram, Father Calloway reported that our Blessed Lord Jesus appeared to Nigerian Bishop Oliver Doeme, holding a sword, Jesus said, three times, “Boko Haram is gone,” upon taking the sword, it mystically became a rosary. The Most Holy Trinity is often referred to as a mystery of faith. But is a mystery something we cannot understand? Not at all, we can understand the mystery of the Trinity to the extent that God has revealed it to us. So what has God revealed to us about Himself? Today, we celebrate the feast of Our Lady of Fatima, so I figure it’s better to let our Lady speak, than myself. Just a few words that she shared with the three children in Fatima, when she appeared to them almost 100 years ago, in 1917. Will you bear all the sufferings that He sends you? As Knights of Columbus, there’s the expectation that you would be praying the rosary every day. If it can bring peace to the world and an end of war, what can it accomplish in our own lives? May we learn to make that our place of refuge also. [Having trouble finding time to pray the Rosary? Any time devoted to prayer returns the investment many times over. Presenting the check to Bishop Soto and Kathy Conner, chancellor, right, are Knight Mark Mimnaugh and Chapter President Pete Comerford (third from left). The Northern California Chapter of the Knights of Columbus presented Bishop Jaime Soto with a check for more than $4,400 to cover the cost of purchasing 30 ciboria for use by the Diocese of Sacramento at large Masses with numerous participants. The campaign began in November 2013, when Mimnaugh suggested to the chapter that the Knights raise funds to cover the need for ciboria for diocesan Masses with large attendance. Currently at such Masses the ciboria are borrowed from neighboring parishes and sometimes enough are not available for use at events. The USCCB has asked all of us to participate in prayer fasting for religious liberty. BLAZON: Party per chevron inverted Azure and Or, in chief an ancient Greek amphora of the second, charged with the letters “SC;” in base a “M” between an ‘I’ and a “H” all of the first. The episcopal heraldic achievement, or bishop’s coat of arms, is composed of a shield, that is the central and most important part of the design and tells to whom the design belongs, the external ornamentation, that tells the owner’s position or rank, and a motto, placed upon a scroll. For an auxiliary bishop, a fully empowered bishop but without territorial jurisdiction, the shield of his arms is composed completely by his personal design, in this case they are the arms of Bishop Myron J. Cotta. The shield is divided into two main portions by an inverted chevron. Above the chevron, on a blue field, is a golden (yellow) ancient Greek amphora, an earthenware vessel used for the transport and storage of fluids, such as oil. This amphora is emblazoned with the letters “SC,” that form the classic abbreviation for the church’s sacred, holy oil known as “Sacred Chrism.” This composition is em­ployed because the Bishop’s first name, Myron, is the Greek word for chrism. The line of division of the shield, the inverted chevron, is reminiscent of a carpenter’s square thus honoring the bishop’s second Baptismal patron, Joseph, the foster-father of Jesus and husband of Mary. The inverted chevron is also employed to represent the San Joaquin Valley, the Central Valley, of California where Bishop Cotta was born, received his Sacraments and lived most of his life. Below the chevron, on a gold (yellow) field are three blue letters; an “I,” a “H” and a “M.” These stand for the Immaculate Heart of Mary to whom Bishop Cotta has very special devotion. Because there is no specific arrangement of this monogram for Mary, it is rendered here as would be on other pieces, where the more important name, like the surname, is enlarged and placed between the smaller initials, as for Christian or personal names. For his motto, His Excellency, Bishop Cotta has chosen the phrase “GRACE AND MERCY,” for this sums up all that God’s relationship with His People is all about. To reflect the bishop’s heritage, as an Azorean, the motto is rendered in Portuguese. The achievement is completed with the external ornaments that are a gold (yellow) processional cross, that extends above and below the shield, and a pontifical hat, called a galero, with its six tassels, in three rows, on either side of the shield. These are the heraldic insignia of a prelate of the rank of bish­op by instruction of the Holy See. 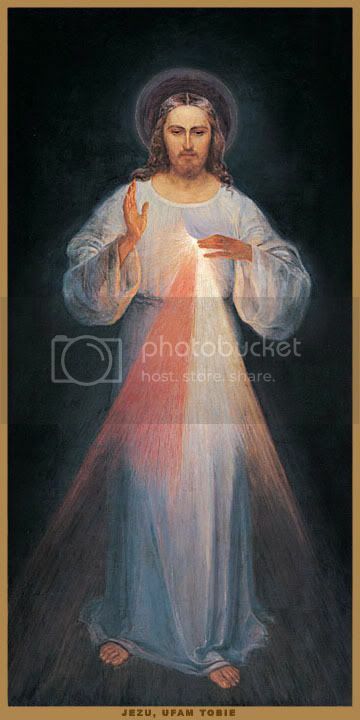 The Novena of the Divine Mercy begins on Good Friday and concludes on Divine Mercy Sunday. Late in the evening on Thursday, November 28, a group of our Knights of Columbus erected our new St. Francis statue onto a concrete pedestal on the south side of the Immaculata, where it will stay for decades to come. We will add some benches and beautify the area in the weeks and months ahead, so that it will become a nice place of prayer. Father wanted to give a special thanks to the Knights for donating their time and labor to make this all happen at no cost to the parish. Also, Father thanks most especially the family that donated the money so that we could afford such a marvelous statue. Many prayers will be offered in its presence for the good of this parish and for many souls. O God, we implore Thee, watch over those exposed to the horrors of war and to the spiritual dangers of a Soldier’s, a Sailor’s, a Marine’s or an Airman’s life. Give them such a strong faith that no human respect may ever lead them to deny it, or fear to practice it. Do Thou by Thy grace fortify them against the contagion of bad example, that, being preserved from vice, and serving Thee faithfully, they may be ready to meet death whenever it may happen. Through Christ our Lord. O Sacred Heart. Inspire them with sorrow for sin, and grant them pardon. Mother of God, be with them in battle, and, if they should be called to make the supreme sacrifice, obtain for them that they may die in the grace of Thy Divine Son. May their guardian angels protect them. Here is a way we Knights could reach out to the community, to let people know who we are, to possibly elicit interest from more potential members. At the July 2013 General Meeting, Dave Leatherby suggested something that had a big impact on a parish community some years ago: A group of men who regularly met in the privacy of a small chapel to pray the rosary once a week were asked to publicly pray/lead the rosary for the whole parish at a gathering. The sight of 40 men on their knees around the altar praying the rosary brought many people to tears. Dave suggested that we Knights might do this periodically (weekly?, monthly?, quarterly?) before Mass, or some other parish event. It would be a wonderful way to witness to the importance of prayer, an example to our families, children. Dave believes it would attract others to want to become a part of such an organization. Pretty simple proposal, we just need someone to schedule and organize it. I went to Mass this morning [Thursday, August 22nd] after dropping off my son at school (it was very good to see Brothers Mark Z and Ron Mahurin there – sorry if I missed someone). As Mass ended, the entire congregation knelt and sang O Salutoris Hostia as Fr. Lee returned the Blessed Sacrament to the adoration chapel. I knelt there in the church and began to consider something that piques my thoughts from time to time; how often I fail to appreciate how fortunate we are to be part of such a vibrant, faith-filled parish (unfortunately, a failure that I exhibit more often than not). Today is a fairly slow day for me which may be the reason I was more open to reflection on this point. I was able to appreciate more fully the beauty and appropriateness of such a small gesture as kneeling in adoration. Moreover, that everyone present knelt in unison heightened my appreciation of this small gesture as truly something unique in our time. This is a daily event in our parish and though small, it is something that we, at Presentation are fortunate to witness and fortunate to have the opportunity to take part in.